Initial comments on the Epson Stylus Pro 7600. For digital photography with pigmented inks: Epson Stylus Pro 7600 and Epson Stylus Pro 9600. 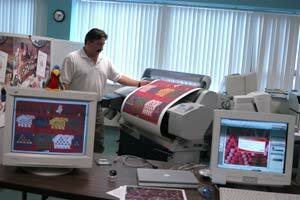 Images of indigenous Mayan textiles from the FLAAR Photo Archive in Guatemala being printed on an Epson 9600 at Parrot Digigraphic headquarters. The output was impressive. We liked what we saw and finally got one for our university. It arrived in early July 2003. Epson now offers carefully thought out printers designed for professional photographers and pro-sumers. Epson has definitely done their homework on what was not satisfactory with their models 7000, 7500, 9000, and 9500. The new printers resolve several of the issues of metamerism, poor grayscale in black and white photography, etc. The precise features and capabilities we will report upon shortly, since an Epson 7600 is on a FedEx truck this week heading to our test lab at Bowling Green State University. By later this summer we should be able to post initial results. It is interesting that Canon, a highly respected camera manufacturer who owns most of the patents on inkjet printers has not been able to design, or market, a printer with the features of Epson or even of the Hewlett-Packard printers. For example, no Canon wide format printer yet offers pigmented ink (a prototype was shown at CeBIT tradeshow in Germany, March 2003). We feel you can get better information on printers that are so new, directly from a capable Epson dealer which we have checked out personally. We recommend Parrot Digigraphic as a reliable place to learn about the new Epson 7600 and Epson 9600 and related digital photography, fine art giclee, color management, scanning, and related matters. Contact: imaging@parrotcolor.com. Epson 7600 arriving at the FLAAR lab at BGSU. 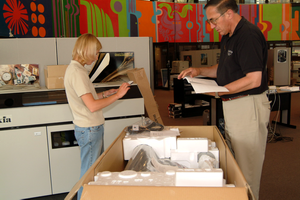 In the background (left), Iris 3047 giclee printer (Ixia model). Right background, dual 3 GHz Dell workstations sent last month by Dell for benchmarking by FLAAR. Last updated July 3, 2003; previously updated June 16, 2003; first posted May 2, 2002.